Controlled Labs Orange OxiMega Fish Oil is a dietary supplement containing fish oil, which provides polyunsaturated fatty acids of the omega-3 family in the dosage of 2000 mg (EPA, DHA, and other fatty acids), as well as 20 IU of vitamin E, which increases the preparation’s stability and longevity. The components contained in the supplement support the normal functioning of the heart and the brain, prevent the development of cardiovascular system diseases and some cancers, and have a positive effect on post-workout regeneration. Fatty acids of the omega-3 family belong to Essential Fatty Acids (EFAs). EFAs cannot be synthesised by the human organism, so they have to be delivered regularly with food. Among omega-3 fatty acids, the most important ones are eicosapentaenoic acid (EPA) and docosahexaenoic acid (DHA). EPA and DHA are metabolically converted in the organism to pharmacologically active compounds – eicosanoids. Eicosanoids, which include such substances as prostaglandins, prostacyclins, leukotrienes, and thromboxanes, are formed as a result of the activity of cyclooxygenase (mainly COX-2), and participate in all stages of inflammation and pain transmission. EPA and DHA are transformed into eicosanoids with anti-inflammatory, anticoagulant, and blood pressure-reducing properties. EPA and DHA metabolism results in the formation of resolvin and protectin. They are lipid compounds with anti-inflammatory activity. They prevent the spreading of inflammation and protect the organism from its negative consequences. The production of resolvins and protectins from omega-3 fatty acids reduces availability to substrates for the synthesis of pro-inflammatory metabolites of omega-6 fatty acids. Omega-3 fatty acids prevent the development of cardiovascular system diseases. EPA and DHA reduce the level of triglycerides in blood, that way helping to normalise the lipid profile. Increased triglyceride levels increase the risk of a cardiac arrest, metabolic diseases, a stroke, or pancreatitis. EPA and DHA also exhibit anticoagulant and anti-aggregant properties, thanks to which they reduce the risk of intravascular clots. Omega-3 fatty acids support post-workout muscle regeneration. Thanks to their anti-inflammatory activity, EPA and DHA supplementation helps to reduce delayed onset muscle soreness (DOMS) after intensive physical effort. Optimal muscle regeneration enables faster muscle tissue growth. DHA is essential for the normal functioning of the nervous system. As an element of cell membranes, it can be found in cells in the entire organism, including nerve cells. DHA stimulates their growth, and its deficiency is connected with the risk of developing degenerative diseases in the elderly. Omega-3 fatty acids are crucial for the right development of babies. Omega-3 supply in the prenatal period is essential because of the role of the fatty acids in the right development of the brain and the retina of the eye. Providing children aged 2 and younger with optimal amounts of omega-3 supports their normal physical and intellectual development. Vitamin E is an antioxidant compound. As a so-called free radical sweeper, it protects sensitive biological membranes and lipoprotein in plasma from the toxic activity of free superoxide and lipid radicals. Vitamin E also exhibits protective properties regarding the vulnerable omega-3 fatty acids, whose polyunsaturated bonds make them unstable and susceptible to oxidation. Thanks to its antioxidant and stabilising effect on cell membranes, vitamin E is an important element of preventing diseases of affluence. It increases the flexibility of blood vessels and has a positive effect on the skin, strengthening its natural protective barrier. Generally speaking, vitamin E slows down aging processes in the organism. 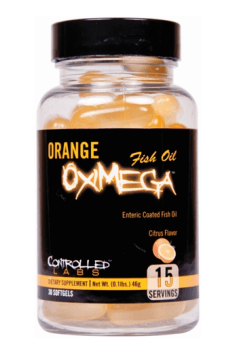 To sum up, Controlled Labs Orange OxiMega Fish Oil is a dietary supplement recommended particularly for the purpose of improved post-workout regeneration, complementing the therapy and prevention of cardiovascular system and autoimmune diseases, enhancing the condition of the skin, supporting immunity and cognitive functions. It is recommended for children, seniors, and pregnant and lactating women. Orange OxiMega Fish Oil 30 caps. First serving: Start by taking 1 softgel to assess your individual tolerance. Regular use: Take 2 softgels once or twice per day with meals. It has been proven that supplementation of omega-3 with a meal rich in fats increases the bioavailability and reduces the risk of discomfort in the gastrointestinal tract. The American Heart Association recommends taking n-3 in the daily dose of at least 1 g, that is, as much as is in one capsule of Orange OxiMega Fish Oil.